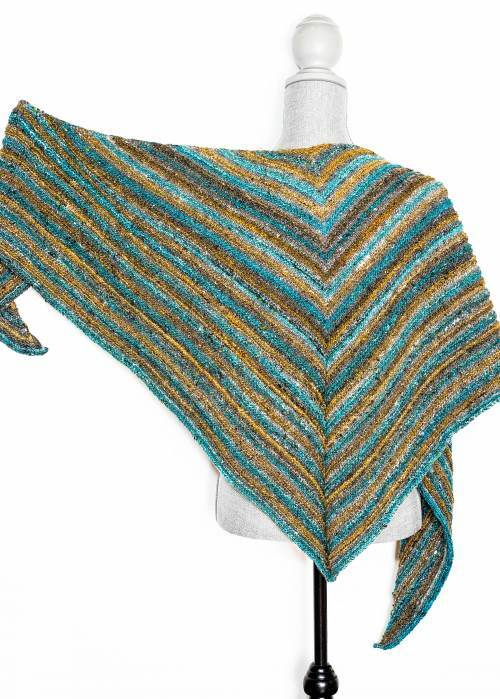 The Odessa Shawl is the perfect accessory to wrap around your shoulders. Alternating rows of Garter and Stockinette stitches create a textured canvas to display the stunning palette of colors of Noro’s Kiri yarn. Yarn A - 1 skein of Noro Kiri yarn; 45% Silk, 43% Wool, 12 % Mohair; 350 m/100g in color 2. Yarn B - 1 skein of Noro Kiri yarn; 45% Silk, 43% Wool, 12 % Mohair; 350 m/100g in color 11. Yarn C - 1 skein of Noro Kiri yarn; 45% Silk, 43% Wool, 12 % Mohair; 350 m/100g in color 6.